April 3, Happy Birthday, Sandra Boynton! 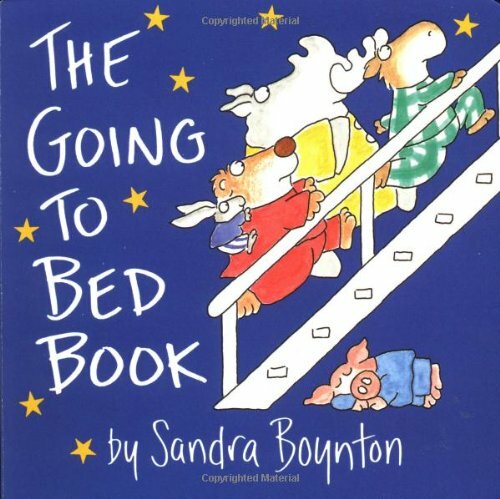 Sandra Boynton’s board books were some of the first books my boys looked at, teethed on, played with, and listened to during shared reading times as babies and toddlers; and my granddaughters are carrying on the tradition. Her books are engaging, whimsical, and clever — a delight for children and their grown-ups. Hold your baby on your lap when your baby is calm; get cozy and cuddly so your baby can see the pictures. Remember proximity is important during shared reading it fosters a positive experience. Engage your baby’s attention, if it looks like your baby’s attention is drifting — tap on the book with your finger and comment on the words and pictures. Also, encourage your toddler to help you turn the board book’s pages for simple engagement. Boynton’s creatures have expressive faces, try to copy those faces and adjust your voice to show the emotion. Board books are sturdy. Let your baby hold and manipulate the pages, in order to get used to the open/shut motion of the pages. Extend that practice to other objects with hinges, such as old CD/DVD cases, to further exercise their hand-eye coordination. All kinds of doggies, and just when you think you know what to expect there’s an amazing plot twist — surprise! All the animals on the ark get ready for bed and so should the readers. A lovely way to review common bedtime routines. Classic board book fun for everyone. Encourage your toddler to move around like the animals. Another classic baby board book. Have fun making all of the animal noises and get your child to do the same. The cute critters of Boynton plus a variety of textures to feel on the pages make this book extra interactive for the littlest ones. Also, this is a Pennsylvania Center for the Book recommendation for family literacy books. OK, I fibbed, have to include Blue Hat, Green Hat because the turkey is too funny. I always cheer for the underdog, even when he is a turkey. I can read this book a dozen times in a row (yup, I have) and still chuckle in the right spots.